Bob and I were up well before sunrise in order to get an early start driving west from the CA/NV border on Interstate 15 to the Halloran Summit exit for the first stop of the day. This minor summit appears in Andy Zdon's Desert Summit, a compilation of 334 desert summits that Bob and I have both been pursuing as a side project. 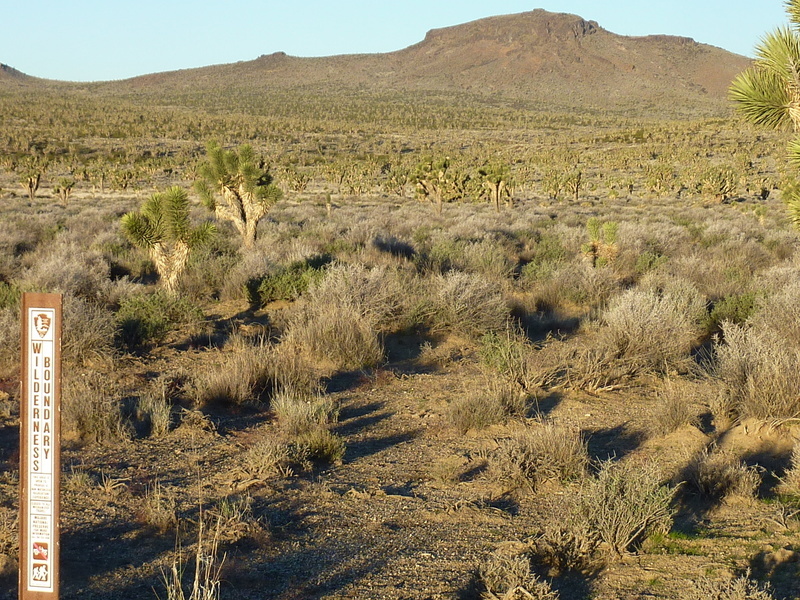 The peak is one of several features in the Cinder Cone Lava Beds west of Cima Dome in the Mojave National Preserve. The drive is somewhat tedious, more than 11mi on fair roads that Bob's high-clearance Liberty had little trouble with. We started from a point about 2.5mi east of the peak as described by Zdon. Our route was a fairly direct line to the summit with the first two miles mostly flat and then directly up the east side that featured some easy class 3 scrambling on volcanic rock. It took just over an hour to reach the top. Mark Adrian had left a register earlier in the year, the old one having disappeared. We found a reference mark nearby but no benchmark. Bob suggested a variation on the descent that proved a little easier technically but no faster than the ascent route. We were done by 9a, a little over two hours after starting out. My suggestion that we tag Button Mtn while we were in the area was met with some disdain and I was unable to provide a convincing argument why we should care. Bob still maintains some standards while recognizing that I have almost none. This is the highpoint of the Hollow Hills Wilderness area found just northeast of Baker along I-15. We followed driving directions out of Halloran Springs provided by Dan Baxter on Peakbagger.com, though we didn't bother with the hiking description which seemed overly complicated for my short attention span. With the summit less than two miles away, we headed southwest downhill across a low-gradient wash before climbing up one of the ridgelines heading to the summit, at first climbing west but eventually curving around to approach the highpoint from the north. It took just over an hour to reach the highpoint at the south end of the summit plateau where we found a 1980 MacLeod/Lilley register. There were only about ten parties signing in over the past 35yrs - a fairly obscure summit. Most of the names were familiar, including a 1996 visit by Andy Smakto & party (who couldn't help mentioning he and Bill Schuler had climbed it before MacLeod), the usual San Diego suspects, the ubiquitous Sue & Vic and of course Dan Baxter. For the descent I talked Bob into a looping route along another ridgeline to the south, or thought I had, but somehow this devolved into dropping into the drainage between the two ridge routes, which also worked just fine. Part of this was along a nice, sandy wash that took us out to the broader wash that we followed uphill to where we'd left our vehicle. We were done by 12:30p and back out to Holloran Springs sometime after 1p. Bob decided to head home while I still had a few more days, so we parted company while I looked for something to do with the rest of the afternoon. Another Zdon summit, this one lies in the Mid Hills near the center of the Mojave NP, roughly between the Providence Mtns to the southwest and the New York Mtns to the northeast. The dirt Cedar Canyon Rd that accesses the area and passes to the south of Pinto Mtn is excellent, suitable for any vehicle at reasonable speeds (up to 40mph). While Zdon's hiking directions are adequate and will get one to the summit, it is not the shortest route. I started about 4/5mi east of Zdon's start, making for a 2.7mi effort to Zdon's 4.5 miles. A cattle guard and fenceline are found where I parked. The summit is not quite in view to the northeast, hidden behind a cliff band in the foreground hills. The cliff band may have been why Zdon chose his route, but it is easy class 3 to get through the lowest point of the band, the only difficulty of any sort on the route. Once above the cliff band the route becomes much more mundane, an easy slope up to a very flattish summit that is so large that good views are hard to come by. A wooden stake near the benchmark helped in locating the register. A fire had swept through the area sometime before 2008, burning the old register and pretty much everything growing in the area. The trees have not recovered but desert scrub and other plants are regenerating slowly. Shane Smith, Terry Flood and Dan Raether were among the recognizable names found in the new register comprising eight pages. I don't know if it is just me but for some reason your lists aren't working, like when you click the DS list it says you have climbed 0/334.